Mirdif City Centre is a great place for shopping. You can find a variety of high quality products at affordable rates. But apart from shopping, it is a great place for entertainment as well. There is an indoor skydiving centre – iFLY – which is located inside the shopping centre. It is an awesome place to experience the thrill of flying without jumping from a plane at a height of 13,000 feet. 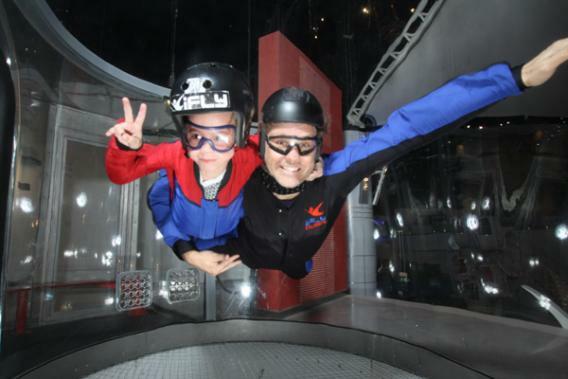 At iFLY, you will be instructed by professional trainers to make your experience unforgettable. It is spread over a vast area of 773 sqm and offers an extremely exotic adventure. For the beginners, there is a 35 minutes lesson in which they come to know about the basic techniques, and after that they can fly for two minutes along with an expert instructor just to give them a practical experience. Make sure that you bring along your family or friends so that you can all enjoy and have a great time learning and feeling exactly what it is like to skydive without having to actually jump from a plane. There is an air conditioning system inside the tunnel to keep flyers cool while they are enjoying their body flight. Before flying you will be provided some useful things like goggles, ear plugs, gears and special shoes. Be sure to pay attention to all the instructions that you will be given so that you have a memorable time flying. The instructors are there to ensure your safety while you fly. From Sunday to Wednesday, the timings are 10am to 11pm, whereas from Thursday to Saturday visitors can come to iFLY between 10am to midnight. These timings are convenient for those that want to have a decent time after work with their friends or colleagues. Be sure to come in a group and have an enjoyable time to help you unwind after a tough day at the office. In case you have any query, you can contact on the given phone number or fill the inquiry form.